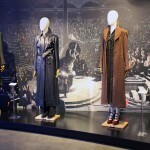 Since Fantastic Beasts: The Crimes of Grindelwald released in theaters, discussion over the merits–or, according to some, the lack thereof–of the film has spread across the globe, across the fandom and across the critical spectrum. 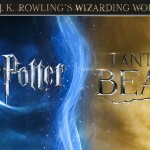 The numerous plot twists have provided much fodder for debate, with Leaky addressing the questions raised and taking the stance that wizarding world and series creator J.K. Rowling will provide the answers for all that baffles in good time. As evidence of our trust in Rowling’s story-telling mastery, our commentary cited examples from the Harry Potter series of questions that loomed large from book to book and of unexpected and inexplicable plot twists that magically came together in the end. And the more we consider the details of Fantastic Beasts and Where to Find Them and its sequel, the more we discover parallels between the two–which should set fans’ minds at ease. Rowling is not repeating herself, but nor is she in uncharted territory. Whatever you want to call these–cliffhangers, unanswered questions, plot twists–J.K. Rowling began planting seeds in the very first book that did not come to full fruition until the final installment in the series. She introduced Professor Severus Snape, one of the most loathsome, clearly evil characters ever written, only to reveal six books later that he’d been a double agent, working for Albus Dumbledore and protecting (but also horribly bullying) Harry the whole time. Early on she introduced the concept of a connection between Harry and Voldemort but never explained how that worked or why they were connected until the final conversation between Harry and Dumbledore at King’s Cross Station. Rowling fed us huge details and twists just as books closed: Peter Pettigrew was the Potters’ betrayer; Barty Crouch Jr. had masqueraded as Mad-Eye Moody in order to lure Harry into Voldemort’s trap and facilitate his return; a prophecy had been made about Harry which led Voldemort to target him and tie their fates together; Dumbledore was killed by Severus Snape; and Voldemort had created horcruxes through dark magic which Harry must locate and destroy in order to stand a chance against the Dark Lord himself. The examples are many, but it’s easy to forget how mind-blowing they were at the time and how anxiously we waited for each successive entry–with more hints and, we hoped, more answers. It’s not surprising, then, that Rowling continues this trend in the Fantastic Beasts series. 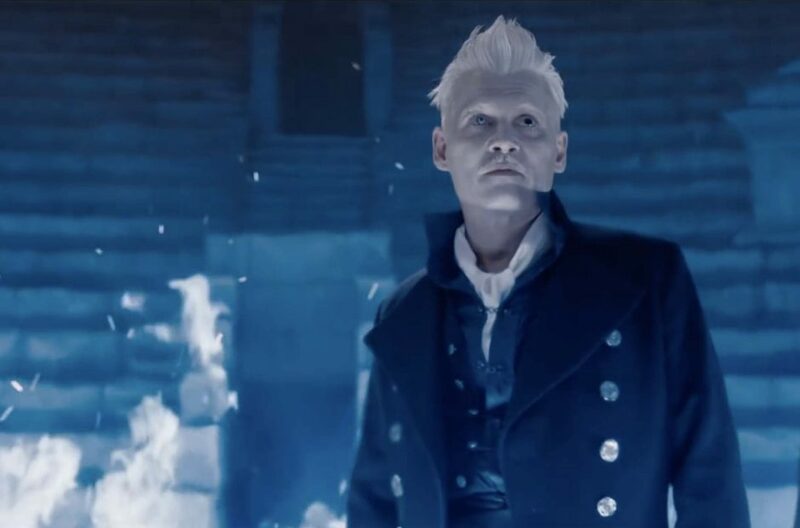 At the end of Fantastic Beasts and Where to Find Them she revealed that Graves was, in fact, a transfigured Gellert Grindelwald. She revealed that Credence Barebone was the sought-after Obscurus. She hinted that he had not been killed after all. And by the end of Fantastic Beasts: The Crimes of Grindelwald, she revealed the astonishing alleged identity of Credence Barebone–Aurelius Dumbledore, brother of Albus. She revealed that Grindelwald and Dumbledore had created a Blood Pact which bound the two in a non-aggression treaty. She hinted that it can be broken. Given where Rowling has taken us before, navigating the most bizarre of cliffhangers and questions, it makes sense that she is equally confident in her current course and will continue planting seeds until she is ready for the story to take full bloom. Another interesting parallel between the two series is the emphasis on an orphan and the pivotal role he takes in relation to the main antagonist. 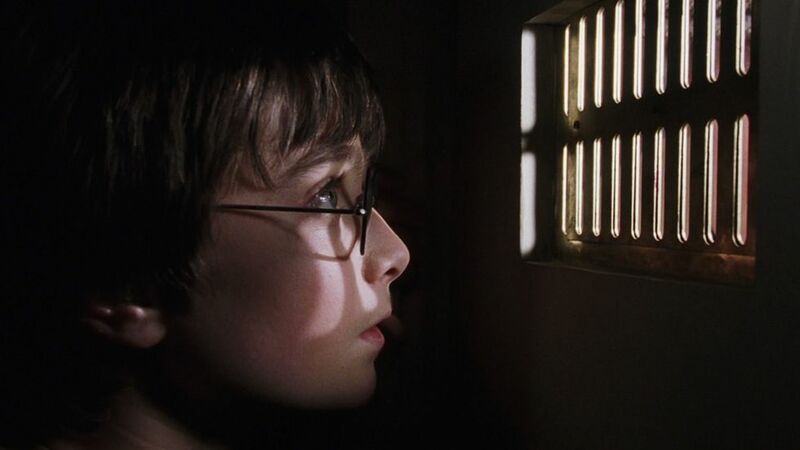 As we well know, Harry Potter was orphaned when Lord Voldemort murdered his parents, leaving him under the watchful eye of Albus Dumbledore but under the immediate care of his muggle relatives, the Dursleys, until his 11th birthday, when he was admitted to Hogwarts School of Witchcraft and Wizardry. Though many other characters contributed to Voldemort’s eventual demise, ultimately, his fate rested with Harry. Similarly, Credence Barebone was orphaned. He was, through an unexpected twist, switched with Corvus Lestrange by Leta and saved from a watery death, with “wings from the water.” He was deposited in an orphanage run by a family as anti-wizard as the Dursleys ever were. Both sets of adoptive parents were bound and determined that neither boy would ever be exposed to magic or discover the truth about their heritage. In fact, the oppressive, hateful environment in which Credence grew up contributed to him becoming an Obscurus. It is possible that Mary Barebone received a letter of invitation from Ilvermorny on Credence’s behalf and never gave it to him. So he remained in her care, growing ever more volatile. Perhaps Dumbledore learned from this sad event, which ruined countless lives, and this experience caused him to persist in pursuing Harry after the first letter was declined. He sent letter after letter after letter, finally sending Hagrid to fetch him and bring him into the wizarding world whatever the recalcitrant attitude of his relatives. Perhaps he could not see another talented young wizard, marked by destiny, destroyed. Also linking the two stories is an emphasis on prophecies. And not only that the prophecies significantly influence the actions of the main characters, but also that the prophecies have dual interpretations–providing a vehicle for misdirection which Rowling uses to her benefit when constructing the plot twists and conflicts. We came to learn that the prophecy could have referred to Harry Potter or to Neville Longbottom. Both boys were born at the end of July. Both boys’ parents defied the Dark Lord three times. And Voldemort chose Harry. His action, based on the fragment of prophecy overheard and passed on by Death Eater Severus Snape, enacted what he strived to avoid. 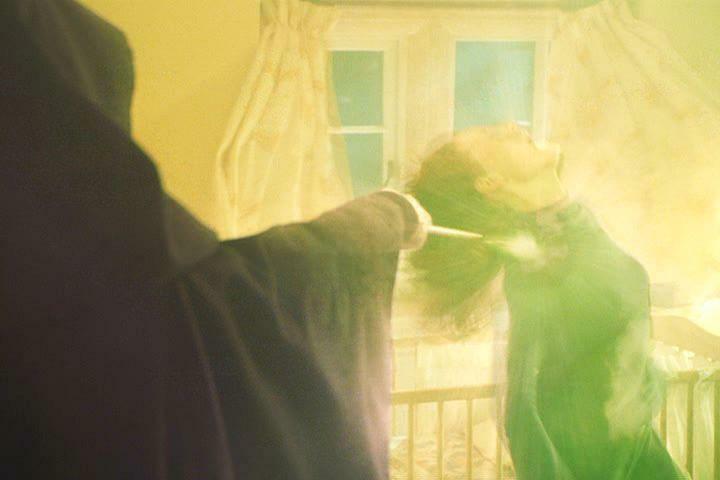 He moved against the Potter family, setting in motion a chain of events that would “mark him as his equal.” He marked Harry as his rival by choosing him as his opponent, by putting Lily in a position that led to her sacrifice and the magical protection that weakened Voldemort while strengthening Harry and by, inadvertently, creating another horcrux, transferring a piece of his soul to Harry, along with some of his abilities. We cannot know what would have transpired if Voldemort had chosen Neville, but it is safe to say that the result probably would have been vastly different. Even if Voldemort had attacked while the Longbottoms were home, it is not certain that what followed would have played out the same way it did when he entered the Potter household. As discussed, the deep magic that the Dark Lord knew nothing of was inspired by Lily’s willing choice to step in front of her son and take the Killing Curse when she had the option to live. While Frank and Alice would have undoubtedly sacrificed themselves for Neville in the same way, it is unlikely they would have had that same opportunity because Voldemort would have had no reason to offer it. He would have killed them as he mercilessly killed James, without hesitation. So, though “marked as an equal” by his choice, Neville probably would not have survived, would not have adopted some of the Dark Lord’s powers and would not have grown up to participate in his defeat. How, then, the promise that he would possess “power the Dark Lord knows not”? It could simply have been the power to love and hope as opposed to power derived from magical protection. The interesting thing, in looking back on the prophecy, is that it did not guarantee Voldemort’s demise or Harry’s survival. Neither did it guarantee Neville’s. It says “neither can live while the other survives.” One of them had to die. Voldemort could have won. Harry had the ability to vanquish him, but it was not certain until it was accomplished. And the beauty of Rowling’s story is that Neville still played a pivotal role in bringing it about. Neville destroyed the last horcrux, rendering Voldemort vulnerable during the final duel. Elder Wand or no, without destroying Nagini, the Dark Lord would have lived to see another day and another battle. 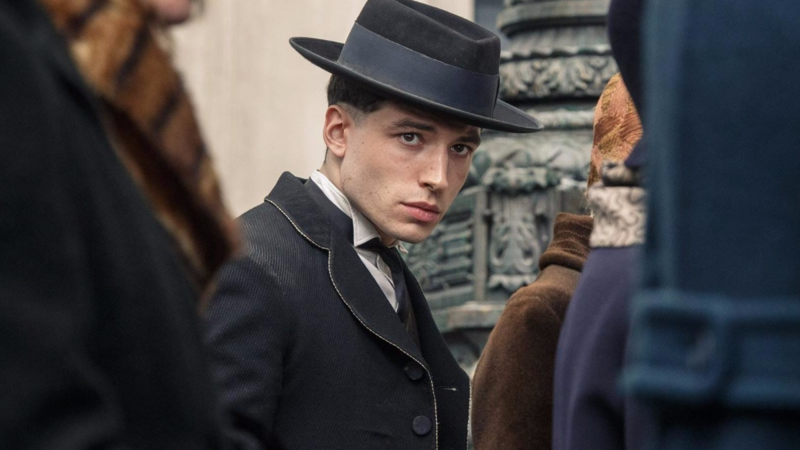 Rumors began to swirl in the wizarding world that the prophecy referred to Corvus Lestrange, and an important contingent believed that it specifically referred to Credence Barebone. Yusef Kama was among those hunting him. He later revealed that he sought Credence not to protect him, but to kill him. As the awful truth unfolded, we learned that Yusef’s mother was bewitched by Lestrange, who took her as his mistress. She bore two children–Leta and Corvus. Leta, he despised and rejected. Corvus, he cherished most of all his children, and he cared not when the mother died in childbirth. But Yusef and his father were devastated and swore to avenge their family. In an effort to protect his favored son, Lestrange intended to hide him, sending him on an ocean voyage with Leta and their half-elf servant. Yusef believed that the prophecy referred to Corvus, banished by his father–a cruel fate for any child–to the despair of the forgotten and ill-treated daughter who was sent with him. When the ship went down, both were presumed rescued from a watery grave, causing the avenger, Yusef, to reignite his pursuit. We discover, however, that Yusef has misinterpreted the prophecy. After Leta’s revelation that Corvus did not survive the disaster, their understanding of the prophecy is called into question completely. But by the clever turn of phrase, we can see that it still applies to Credence in one of two ways–or both! The “son cruelly banished” could be Corvus, as originally assumed. “Despair of the daughter” is Leta’s regret over switching the babies the night of the disaster. Yet, because of that choice, Credence, who would have died, returns as the “great avenger with wings from the water.” Kama writes himself into this as the “great avenger,” however, giving the first inkling that his interpretation was incorrect. Rowling’s way with words is truly magical, and the fact that there are so many subtle ways she can take this prophecy as a result of how it is carefully written, gives us chills of anticipation as we look forward to discovering which meaning she intended. Either way, major players in the story will continue to act on their own understanding of the prophecy, driving toward the destiny they believe it foreshadows. What is remarkable is that the parallels between the two series are not only the surface likenesses, that we return to the wizarding world with well-known loved characters, but that the deeper constructs of magic are essential to the stories–and in similar ways. As discussed above, in Harry Potter and the Half-Blood Prince, we learned that a crucial element of the story was that Voldemort had created horcruxes in an effort to render himself indestructible and, thus, immortal. By embedding parts of his soul outside of himself, he ensured that he would survive any attack so long as those pieces still existed. He accomplished this dark magic through the most heinous of acts, through murder. In essence, he did it through the shedding of blood, if not literally then figuratively. By the climactic chapters of Harry Potter and the Deathly Hallows, we discovered just how significant this magical construct was. Rowling finally confirmed what she had carefully alluded to all along, that Harry himself was a horcrux. This explained his unusual connection to the Dark Lord and his possession of similar powers, and it set up the complicated ending, that Harry needed to die in order for that part of Voldemort’s soul to be extinguished. Death begat death. What’s interesting is that the Fantastic Beasts series now also hinges upon a magical construct–the Blood Pact. The similarities may not be so obvious at first glance, but consider the following. The Blood Pact, as far as we can tell, was a binding act of magic sealed by the shedding of blood. The intention of the pact, at least in the case of Dumbledore and Grindelwald, was preservation of life. That is, that neither could attack the other. It was predicated on the presumption that no other wizards existed to challenge either man, so the effect of the pact created a measure of protection that Voldemort also hoped to achieve. Almost certainly, we will find out soon enough, as the next two films will likely revolve around the quest. Rowling also continues to use acts of sacrifice to make important points about her story and the world–both wizarding and non–and she treats such sacrifices with incredible care and compassion. The Harry Potter series was rife with sacrifices, including those which exacted the full measure. Rowling depicted the bravery and the nobility of characters such as Fred, Remus and Tonks, always respecting their willingness to die so that others might live, while not overshadowing the bitter cost when those sacrifices must be made. The toll on those left behind is excruciating, no matter the pride that simultaneously rises. The struggle to balance the weight of their absence with the gratitude for the price paid is lifelong. This is most poignantly concentrated in the character of Lily Potter. Lily chose to plant herself in front of her son and take Voldemort’s Killing Curse in the hope that doing so would alter the fate he designed. She chose love over life, and her choice did matter. Her choice preserved and protected Harry, and when he learned the truth about her death, he could not but be moved by the love that motivated her. The truth of that and the hope it engendered bore Harry along in his darkest of times. Still, it did not protect him from the loneliness and isolation that also came with her sacrifice, and that made him into the man he became as well. For Rowling, there are no easy outs. She chooses hard things for her characters and depicts the hard consequences of them. But this also gives her a platform to inspire–because sacrifices do that. Lily’s love and sacrifice inspired and bolstered Harry to willingly make his own–and that made all the difference. 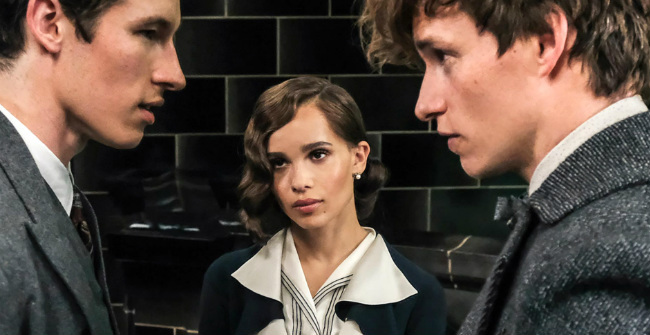 Fantastic Beasts continued this trend when Leta stepped into the line of fire, focused Grindelwald’s attention on herself and allowed Newt and Theseus to escape. Her motivations were complex. She still keenly felt the sting of regret over what she had done to her brother Corvus and, in her eyes, such a sacrifice might have been warranted and redeeming. After a lifetime of being neglected by her family, outcast at school and uncomfortable in her new life as an adult, she likely felt worthless, in spite of the Scamander brothers’ attempts to convince her otherwise. Sadly, she might have believed her sacrifice would finally give her the worth she already possessed. But, ultimately, it’s clear that the final decision turned on her great love, as it did for Lily, and that was echoed in her final words to them both. That the impact of her sacrifice will reverberate through the story is unquestioned. How it will specifically effect Newt and Theseus it still to unfold. Both stories revolve not only around a small group of main protagonists, but also around a main antagonist, and these two series specifically focus on the rise, and return, of the two greatest dark wizards in wizarding history. And, like many men who pursue power through oppression, a slogan is used throughout their campaign as a rallying cry to bolster support and champion their cause. Grindelwald’s slogan and approach are more winsome. He seeks not to overpower but to persuade with the slogan “For the Greater Good.” Any acts of force take place behind the scenes. For now. There is an underlying sense of intimidation, but he is careful to avoid the appearance of oppressing the non-magic as he elevates the magical. Instead, he charismatically appeals to the desire of all people for freedom–freedom from the constraints of society and its conventions, freedom to openly be who they are. The parallel, of course, is that both desire the same thing, though they go about it through different means. Both wizards desire, in the end, the superiority of their kind and the subjugation of everyone else, and what is very interesting about these series is that Rowling not only gives us engaging stories, but she also turns a lens on what we can learn about history and leadership. She beautifully contrasts what it looks like to use power wisely and what it looks like when power corrupts. And that corruption led both wizards to do heinous and appalling things. Voldemort and his Death Eaters openly tortured and murdered wizards who would not join them. Some of the most well-known examples had horrific consequences. Bellatrix Lestange tortured Frank and Alice Longbottom until they lost normal cognitive function and had to live out their days in St. Mungo’s Hospital. More gruesome than that was Voldemort’s willingness to kill an entire family, including their helpless baby, Harry. 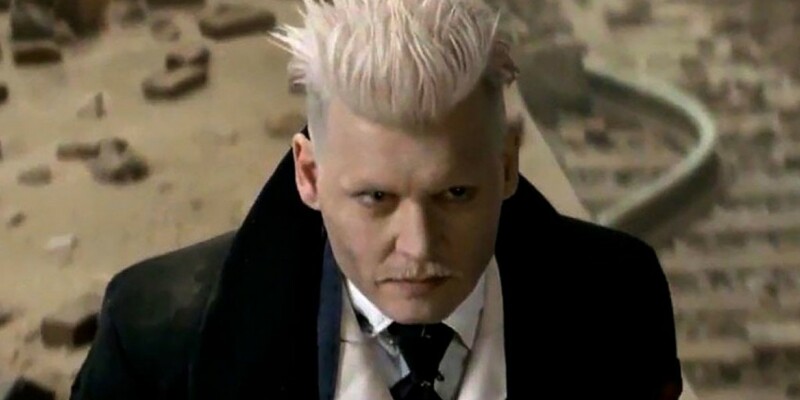 Likewise, Grindelwald did not hesitate to murder an entire household, including their own small child, simply because he wanted to use their place of a residence as a point of operation. In both series, Rowling uses an enchanted object, the Mirror of Erised, as a device for introspection and revelation. It shows that which characters cannot or will not state explicitly about their desires. The inscription on the mirror reads: “erised stra ehru oyt ube cafru oyt on wohsi.” It must be read backwards to uncover its true purpose, which says, “I show not your face but your heart’s desire.” The mirror does not reflect a person as they are. Rather, the image unveils the innermost longings of the one staring into it, and this magical object is used in both series to not only give us deeper insight into the characters but also to move the story along. 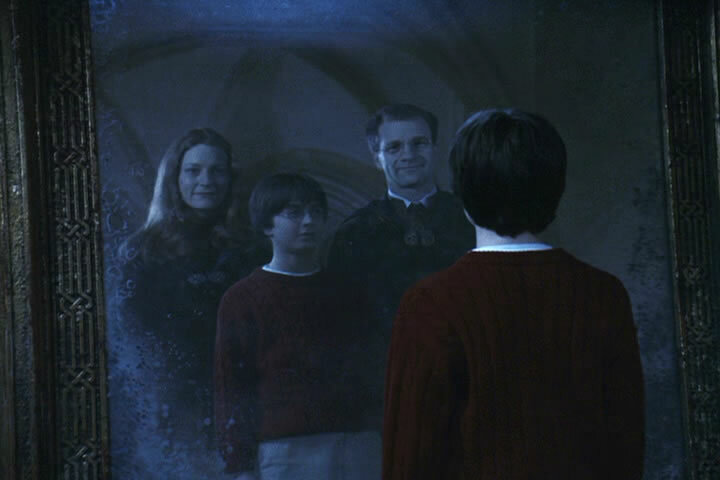 In Harry Potter and the Philosopher’s Stone, Harry first encountered the mirror accidentally. He was entranced by the image of his happy family and the parents he so dearly misses. This clued us in to how significant their absence remained in his life, even after he found a home at Hogwarts. Later, Rowling used the mirror as the vehicle to stop Voldmort from returning, as Harry was the only one who desired to possess the Philosopher’s Stone but not use it. The mirror reappeared in Harry Potter and the Order of the Phoenix to show us that Neville, like Harry, continued to feel the pain of his parents’ fate and mourn what was and might have been. It helped us understand more about Neville’s journey and established a common bond between the two. 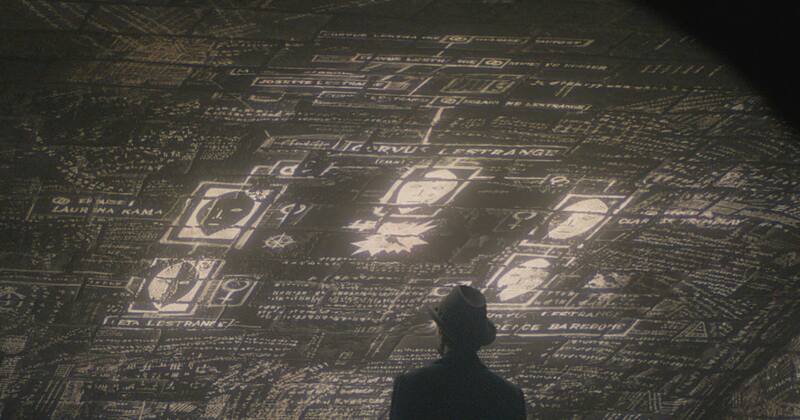 In Fantastic Beasts: The Crimes of Grindelwald, we discover that Dumbledore himself spends time before it. 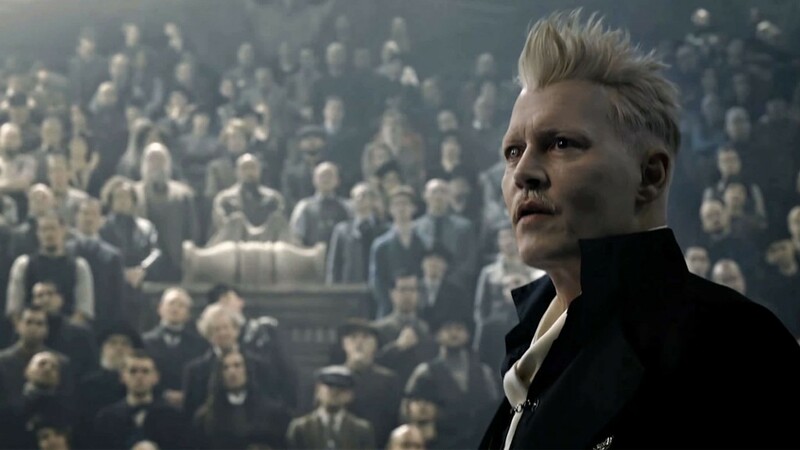 We see the conflict inside him, that he longs for the closeness Grindlewald and him once had, which makes the fact that he must now oppose Grindelwald all the more difficult. We also see that the Blood Pact is what bars the way to him being able to stop Grindelwald’s rise once and for all, in spite of his feelings. Rowling masterfully uses the mirror, again, to develop the character while also driving the plot forward. It also explains how Dumbledore is later able to speak to Harry about its lure with such empathy and wisdom. She also devises enchanted objects that allow others to experience recollections in a unique way. 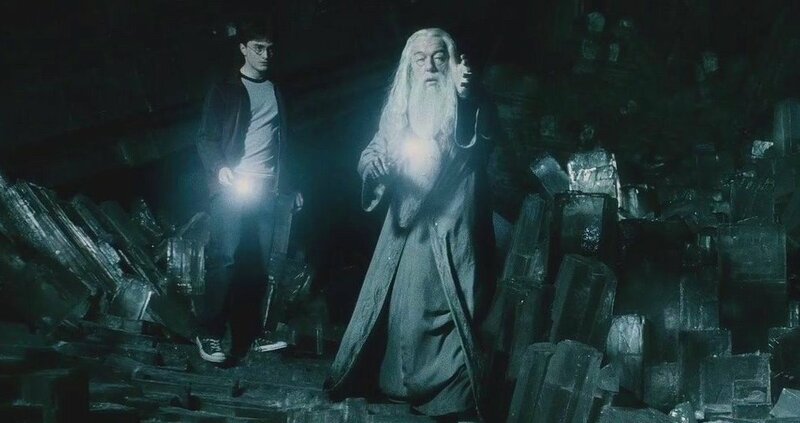 In the Harry Potter series, Dumbledore possessed a pensieve, an enchanted bowl which allows someone to re-live a memory. By pouring the vial of a magically-collected memory into the pensieve, a person can immerse themselves in the liquid and observe everything that occurred as though for the first time. This was useful for Dumbledore as it enabled him share details with Harry about Tom Riddle that were better shown than relayed. And it proved essential in Harry Potter and the Deathly Hallows because the pensieve allowed Harry to view memories which Snape, then dead, could no longer pass on. 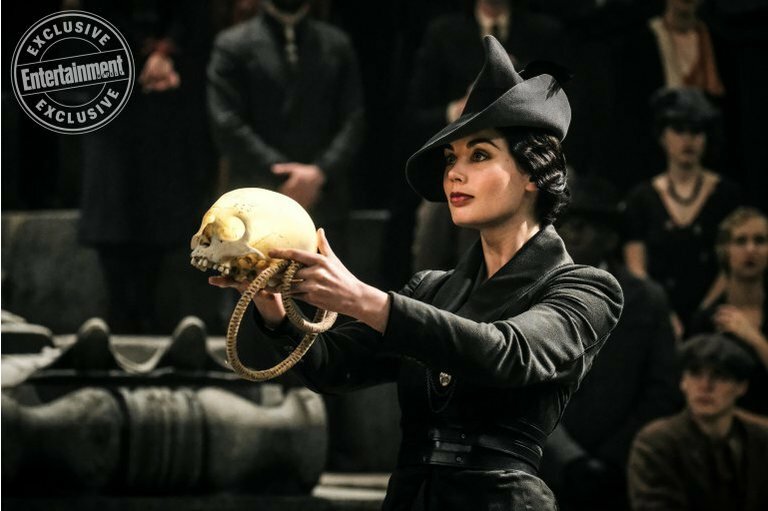 In Fantastic Beasts: The Crimes of Grindelwald, Grindelwald possessed an unusual glowing skull, which seems to operate by enhancing or replaying visions for others to see. It’s as if he expelled the essence of the memory with his breath and, funneled through the magical object, it was projected before the watching world. It’s certainly a very interesting parallel. Though the enchanted objects don’t work in the same way, they perform like functions in the story. Another similarity, for which we are very grateful, is the return to familiar settings. While the wizarding world continues to expand through the Fantastic Beasts series–taking the story to New York, Paris and, possibly, Brazil–some places will always be the heart of both series. The majority of the first six books (and films) in the Harry Potter series were set at Hogwarts School of Witchcraft and Wizardry. The school became Harry’s home and the site of his development as a young man and a wizard. Though he had to leave the school in his seventh and final year in order to see Dumbledore’s mission to the destroy the horcruxes through to the end, the trio returned for the climactic Battle of Hogwarts, and it was fitting that the story culminated in that place. Hogwarts gave Tom Riddle a home and held out a path which he rejected. It likewise gave Harry a home and a purpose which he embraced. That the two should conflict on those grounds and find Harry triumphant was both resolution and vindication. So we were delighted that Crimes of Grindelwald brought us back to the halls of Hogwarts to see Dumbledore in action as a Defense Against the Dark Arts teacher–using the same teaching method later employed by Lupin to fight Boggarts–and to explain his transition to the post of Transfiguration professor, a move imposed by the Ministry of Magic. Through touching flashback scenes reminiscent of Snape and Lily, we also saw Newt and Leta as young students and learned how their friendship developed. They bonded over being outcast and misunderstood, finding solace in their companionship. 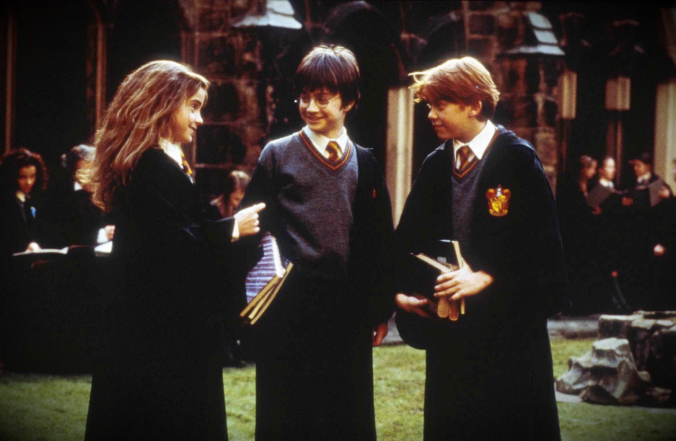 As in Harry Potter, Rowling depicts Hogwarts as a place where lasting, redeeming friendships are made. It’s about more than magic–it’s about how lives and choices are shaped. Hogwarts is, rightly, the place that best tells the story and captures our imaginations. 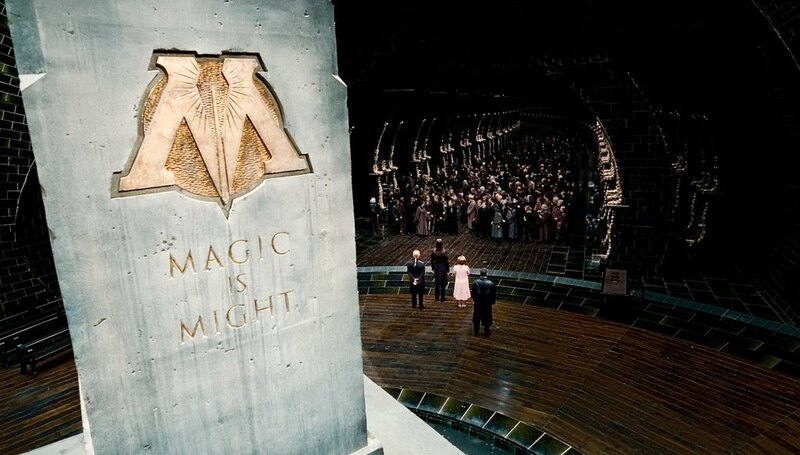 It is home for them and for us, and we can only hope Rowling takes us back again and again. Of course, there’s also a clear parallel in the wide array of magical creatures featured. The Harry Potter series first introduced us to a love of beasts through Hagrid. From his faithful boarhound Fang to Norbert the dragon, Fluffy the three-headed dog, Buckbeak the Hippogriff, Aragog the Acromantula and even Blast-Ended Skrewts, Hagrid never found a beast he couldn’t love, nurture and care for. We also learned of other magical creatures such as Centaurs, Unicorns, Giants, Elves and Goblins, and Rowling featured them prominently and in a way that gave each dignity and value. In the same way, we see in Newt Scamander a passionate and uninhibited affinity for magical creatures of all kinds. He travels the world to learn about the beasts the rest of the wizarding community avoids or fears so that he can not only help wizards be better informed but also provide compassionate care as needed along the way. He created a rehabilitation center within his magically-extended case as well as a larger sanctuary beneath his apartment. He cares for Bowtruckles, Graphorns, Nifflers, Occamies, Murtlaps, Kelpies, Billywigs, Swooping Evils, Thunderbirds, Nundus, Doxies, Grindylows, Mooncalves and more. And he is one of the only wizards to interact with and research the Obscurus, seeing them as more than what they’ve become. In his mind, they are worthy of help, guidance and protection, and he acts against the prevailing views in the wizarding world to be Credence’s ally, rather than his foe. In the words of Leta Lestrange, he hasn’t met a monster he couldn’t love. Finally, we’d be remiss if we failed to recognize that not every parallel is a serious one. 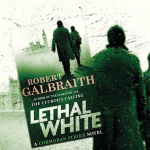 Rowling crafts moments of levity and humor as well as she handles the angst and the conflicts, and one of her favored methods of injecting it into the story is through sarcasm and comic relief. “Sassy Harry” is well-known throughout the fandom, and his witty, acerbic comebacks are highlights of the books. 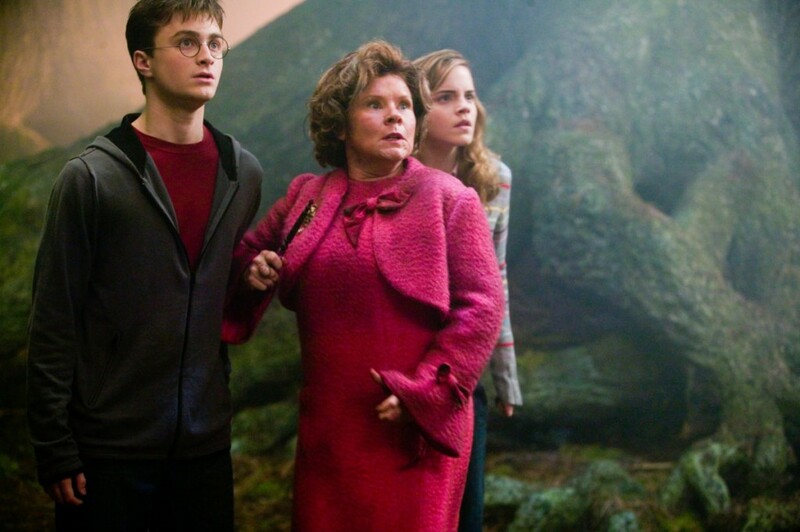 From Harry’s cheeky retort to Snape, “There’s no need to call me ‘Sir,’ professor” to the satisfying mic-drop moment when he tells Dolores Umbridge, “I’m sorry, professor, I must not tell lies” as the Centaurs carry her into the Forbidden Forest, chapters could be devoted, here and elsewhere, to recounting all the sarcastic comments from Harry, let alone the exchanges between Harry, Ron and Hermione and, to our great enjoyment, between the trio and Draco Malfoy. These passages comprise some of Rowling’s best writing, and she didn’t save it all for her books! Fantastic Beasts provides plenty of light-hearted laughs as well. The comedic scenes in which no-maj Jacob Kowalski hilariously reacts to the magical world are pure gold, endearing him to fans and critics alike. His likeliness to Ron Weasley as the “comic relief” of the series has also been noted by Rowling herself, and in Crimes of Grindelwald he continued to carry this torch, with his drunken overzealousness during the love potion scene, to one-liners like “ew, calamari” and, ‘”You didn’t mention Salamanders, did you?” Dan Fogler never fails to fill the theater with laughter! The many parallels between the two series should provoke a welcome familiarity and inspire a ready confidence. Rowling is taking us through a new story with recognizable landmarks along the way, and it’s a wonderful thing to know that at the end of the journey, we’ll find ourselves back where we started–home.